With the kitchen increasingly considered to be the centerpiece of a home, consumers want custom, premium design elements to create a high end look and feel. Exotic woods are excellent contrasts to the stainless steel, clear glass and natural stone commonly found in modern kitchens, softening their overall appearance with traditional, timeless appeal. Today, wood’s presence is extending beyond the traditional butcher block into custom countertops throughout the kitchen – especially islands and eating areas. Wood can be both contemporary and antique, and may be the only surface material that looks better the older it gets. It gives kitchen countertops and bathroom vanities a quality, prestigious look that never goes out of style. 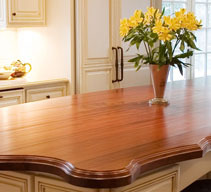 Marvic carries exotic wood countertops from the craftsmen at Craft-Art, the leading name in exotic wood countertops. All Craft-Art wood is inspected for density and strength – the key to durability and performance – and then hand selected and matched for aesthetics. 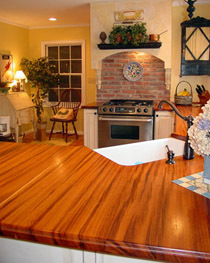 Every Craft-Art wood countertop is protected by a Tung-oil based, organic and food-safe finish. 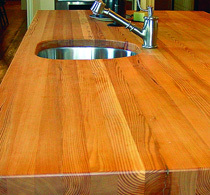 This premium finish makes the countertops waterproof and extremely difficult to stain or burn. Does not use any wood that is being over harvested or that is on any threatened or endangered species list. Actively supports international forestry conservation efforts to increase the use of sustainable forestry practices. Offers products that satisfy Leadership in Energy and Environmental Design (LEED) requirements. Click here for more information on Craft-Art exotic wood countertops including product applications, design considerations (including edge profiles), and wood varieties (species).